It's pretty clear that a mom's long list of things to do and people to take care of does include herself — at the very bottom. Why is it that we are hardwired to put everyone else's needs before our own? However, this year there is one beloved company that wants to make sure that we get a moment to themselves more than simply the one time on the second Sunday in May. Thanks, Lindt! A global leader in the premium chocolate category, Lindt has 170 years of history and currently offers high quality products in more than 120 countries. But now they have turned their focus to moms! In a recent survey, Lindt found that 72% of moms are too busy taking care of others to pay attention to their own needs and 82% agree that there are more demands on their schedules today than there were for women a generation ago. Not only that, but 39% of women say today’s digitally connected world keeps them "always on" and unable to relax. However, 90% of women agree no matter how stressful their days, taking a moment to relax or recharge makes everything better (and get the added benefits of being more patient and understanding around their kids and a boost in productivity). ...because, after all, they only take a moment to enjoy and provide the perfect way to "melt-away!" But beyond their decadent chocolates, Lindt is also asking "Have you felt the #LINDORmelt?" and rewarding many of the great answers! Now through May 31, 2014, chocolate lovers can enter this tasty contest by visiting Lindt's Facebook page and uploading a photo or brief description, sharing how they felt a #LINDORmelt moment with a LINDOR truffle. All entries will be featured in a photo gallery on the brand's Facebook page, inspiring others to enjoy and share their own "melt-worthy" moments. As part of the contest, each day in May five winners will be selected to receive two bags of smooth melting LINDOR truffles – one to enjoy and one to share with a friend. 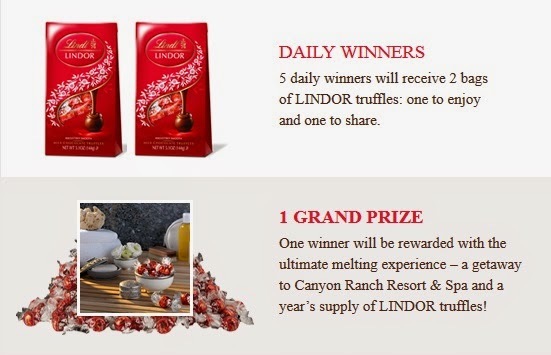 If that's not enough, one lucky grand prize winner will be awarded the ultimate melting experience – a spa getaway to Canyon Ranch in Tucson, Arizona and a year's supply of LINDOR truffles! I sure wouldn't mind a spa getaway to Canyon Ranch... not to mention a year's supply of LINDOR truffles! Consumers can return daily to share more #LINDORmelt moments and increase their chances of winning, so if these prizes sound good to you, too, head over and enter today and every day for the rest of May! It's clear that all of us are constantly involved, whether with work, family or the latest technologies, so be sure to stop to enjoy a LINDOR truffle (it only takes a moment!) and let it provide the perfect way to relax and melt away while sharing your own #LINDORmelt moments on Facebook. 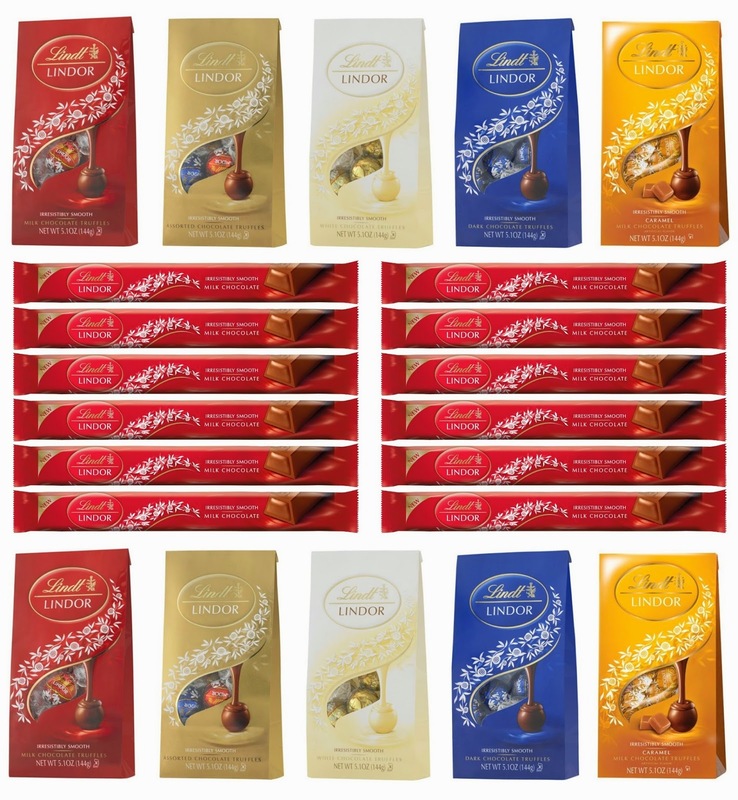 LINDOR truffles and LINDOR sticks* (ARV $52)! *Prize Pack includes (2) 5.1 oz. bags each of Milk, Assorted, White, Dark and Caramel LINDOR truffles and a dozen LINDOR sticks. A big thank you to Lindt for providing a prize pack of items for one lucky giveaway winner. The opinions shared are my own and honest and if you really need to see more, click here to see how I roll. I would love to have a moment after my three kids are in bed for the night! I would love to have a #LINDORmelt moment in the morning while everyone is still in bed, enjoying the sunrise and some Lindor in my coffee! I love having chocolate with a cup of tea so my melt moment would be curled up on the couch reading a book with a cup of tea and Lindor truffles. Perfect end to a long day... would be a nice glass of my favorite wine, and the dark chocolate Lindor Truffles... on my front porch, watching the birds. Aaaaah. I would love to have a #LINDORmelt moment in the afternoon after finishing housework.Actually any time is a good time. After we come home from our walk after dinner. I would love to have a #LINDORmelt moment with my daughter and husband at the end of a long day. This would be great to sit down and have as a family. I like to have a Lindor Truffle with a vanilla latte and my boyfriend. I'd like to come home from work and have a #LINDORmelt before I have to speak to anyone, do dishes, laundry, pick up after anyone, or take care of people and pets. My #LINDORmelt moment would include a nice sunset on an isolated beach. My #LINDORmelt moment would be in a cafe in Paris with some wonderful French roast coffee, the sights and sounds of Paris around me, and a Lindor Truffle to top it off. I would just love to have a Lindor truffle melting in my mouth while I sit back and relax after working the polls all day next Tuesday. Total relaxation. I would love to have a Lindor moment when I get to sit outside this weekend after the rain has stopped!!! I would love a mid morning #LINDORmelt whilst my children are watching their favorite tv show. I would like a #LINDORmelt moment when I am watching a good movie. Planning a BBQ on the first nice spring weekend. I would love to have a #LINDORmelt moment while cozying up on the couch in the evening with my husband after a long work day. I'd love to have a #LINDORmelt moment after finishing cleaning the house and before my kids come home from school. Hi! I would love to have a #LINDORmelt moment first thing in the morning with my coffee. Thank-you! I would like one with my evening coffee. Being as my husband is on a perpetual diet, my idea would be when he has gone to bed and I would sneak out and eat them without him knowing. My best moment for a Lindt would be after my kids have gone to bed when all the homework is done, lunches are made and dishes are finished! Perfect end to any hectic day! My best melt moment would be to have my fiance feed me them in bed. I would love a #LINDORmelt moment when I have one of the chocolates after a busy day at work! I would love a #LINDORmelt moment after the kids are asleep watching Game of Thrones! I would love a moment when my grandson is down for a nap and I pour a fresh cup of coffee! My best #LindorMelt moment is late at night, when I'm the only one still awake and I can relax and really enjoy it. I would like to have a #LindorMelt in the late afternoon to relax after a long day. Thanks for the chance to win! My Lindor melt moment is after dinner when it's time for dessert and I'm watching my favorite television show. I would love to have a moment at night when it's calm and peaceful! I would have #LINDORmelt moment after dinner with a cup of coffee. I'd like my moment after dinner and after the kids are in bed! My #LINDORmelt moment would be eating truffles with my best friend while watching a chick flick. When my son is in bed and I can have a Lindt truffle all on my lonesome. My #LINDORmelt moment would be around 2 pm when the afternoon slump moves in and I start worrying about what still needs to be done, could sit down and just enjoy the moment with the Lindt truffle all by my self. In winter, I love to sit in my whirlpool tub and have lovely music playing, and some Lindt truffles and a good book and let "calgon" take me away!!! My Lindt Truffle moment came after I ran out of gas which made me late for work, which then resulted in a chew-out from my boss, which then made me cranky in turn made me cranky to the customers who called into the office. I was beginning to think I should have stayed in bed until I walked in my house, kicked off my shoes (and socks), walked to my hiding place from the kids, pulled out my favorite chocolate truffle, plumped my weary behind on the sofa and delightfully ate one, two, three , oh I lost count. But everything was great after that. Thanks Lindt! I would like to share my Lindor moment with my husband. what a way to end the day, quietly savoring lindt chocolate or two while reading the latest book. I would love an entire day to myself with a good book and Lindor Truffles. My Lindt moment would be on the couch watching bad TV crime shows. I would like to have a LINDOR melt moment with a fresh cup of coffee. I would love to have a Lindt moment with my family! Id like to share a moment with my grandkids when they come over on the weekend. I'm going to guess that it would happen during the movie Frozen because its always on! I would love to have a real "excuse " for a #LINDORmelt moment, but I work in a grocery store. I have constant temptation all around me , so why wouldn't O pop one of these and toss it in my mouth , that makes me smile !!! Erases stress in an instant . My #LINDORmelt moment would include a bottle of wine and a hot bath. I'd have it with a cup of tea and a cat on my lap. I can eat Lindor chocolate anytime, anywhere. But in the tub with candles lit would be nice!!! My boss loves these chocolates so my moments usually involve work breaks. What a way to take a break! I would love to have a #LINDORmelt moment on the beach with hubby! My moment would be coming home from work, relaxing on my couch with a cup of coffee while eating a Lindor. I would have too say my moment would be right after visiting my brother, lol he has me hooked on truffles. It would be perfect for when my little ones go down for the afternoon nap, and before the big kids get home from school! I have taken these and dropped one into a nice hot cup of coffee before. It gives it that extra chocolaty taste that is to die for! I would have one when I cone home from work so I could unwind from my day. I would like a #LINDORmelt moment while I'm watching a movie. I would like a #LINDORmelt moment after getting good news about my dad's cancer & finally being able to relax.. after months of stress! I would like a moment with these chocolates and a good movie. I would love to have a moment after the kids are in bed! #LINDORmelt moment with my daughter. As a late-night snack after a rough day. I would love a #LINDORmelt moment when I am on vacation with my sister. My Lindor moment would be after work, when I'm snuggled on the couch with a book and a cat. Mmmm... the white chocolate just melting for a moment after the hubby and the kid are in bed... so I don't have to share of course! LOL That would be my moment! Lindor Truffles remind me of my beloved Mom. She always had them available when we came to visit. It was kind of funny--Mom kept her apartment so warm, that the truffles would melt; so, she had to put them in the fridge (because I complained about it. sorry) Wish Mom was still here to share a #LINDORmelt moment with us again. I would love to have a #LINDORmelt moment when I read after I put my son to bed. I would like to have a LINDORmelt moment with a glass of wine with dinner. All 4 kids are in bed, the laundry and kitchen are done, and I can sit bag with a piece of heaven and not feel guilty about not sharing it. I would enjoy these after the kids are in bed and I have sat down for the first time all day. I would like to have a Lindor Melt moment, sitting at my favorite park under my favorite tree, reading my Kindle. I would love to have a #LINDORmelt moment in the morning after every one has left the house for day for school/work. My hubby's moment comes at the end of the day when our son is finally asleep and he can relax. When I go to bed, so I will have sweet dreams. At about 2 o'clock in the afternoon when I need a boost and sweet moment. I'd love to try each flavor with my eyes closed and guess which one it is. I would love to have a #LINDORmelt moment with my husband at the end of a long day. This would be great to sit down and have as a family. cosmicdancerbby: I would love to have a #LINDORmelt moment with my best friend who also LOVES chocolate right after I get off work tonight! My husband occasionally buys me a bag of my favorite white chocolate truffles. I would love my #LINDORmelt moment to be after I meet my great granddaughter. My moment would be while I'm relaxing in bed with a book. I would love to have a #LINDORmelt moment in the evening while I'm relaxing! After the kids have gone to bed would be a good time to enjoy a Lindor! I would sneak a LindorMelt moment in my bedroom while my kids are playing! After teaching an evening class, I board the commuter bus for home and only a Lindor Truffle can smoothe the bumpy ride, mute the voices of noisy passengers, with a tongue-hugging chocolate, the secret, that makes me smile at my reflection in the dark window. After teaching an evening class, I board the commuter bus for home and only the tongue-hugging chocolate of a Lindor Truffle can smoothe the bumpy ride, mute the voices of noisy passengers, and make me smile at my reflection in the darkened window. I got to say the best time for me to indulge in a Lindor is when I've had a tough day. It always is a nice pick-me-up. Sharing the yummy goodness of the chocolate with my daughter. I would like a Lindor melt moment with a cup of coffee in the evening. I would love a Lindor moment on Saturday or Sunday evening while watching Directv. I would love to have a lindor moment on a nice warm night sitting on the porch, enjoying some chocolates with my husband. I would take a moment after the kids go to bed and eat a Lindor! I love enjoying the luscious silkiness of a Lindor milk chocolate truffle... yummy. My ideal #LINDORmelt moment would be after dinner, with a nice glass of red wine and a good dark chocolate LINDOR truffle! I would like a moment in the middle of the night when I am watching a movie. I would love to have a #LINDORmelt momen after a hard day. I would like to have a Lindor moment with a white chocolate truffle outside on the patio at the end of the day. I would love to have a Lindor moment on the first day of summer vacation. My favorite ones are during housework. IT makes the work seem so much less intense! I would like to share my moment with my closest friends. I'd love to be back in Smoky Mountains having a Lindor Moment! My #LINDORmelt moment would be once I've gotten my garden beds all cleaned up and everything is planted, then I could sit back and enjoy my flowers. I would like to have my #LINDORmelt moment after the little one goes to bed, in my bed, with a little tub of Ben and Jerry's and a nice iced coffee and a movie. My moment would be developing the ability to not gain weight from eating these truffles! The white chocolate ones are heaven sent! a reward for every 10 pounds i lose would be an awesome Lindt moment! My favorite Lindor moment would be eating a piece of Lindy chocolate after doing the housework. I would love to have a Lindor moment in a bubble bath. My Lindor moment would be my favorite book and/or magazines, the beach, sunscreen, and my ipod/music -relaxing. 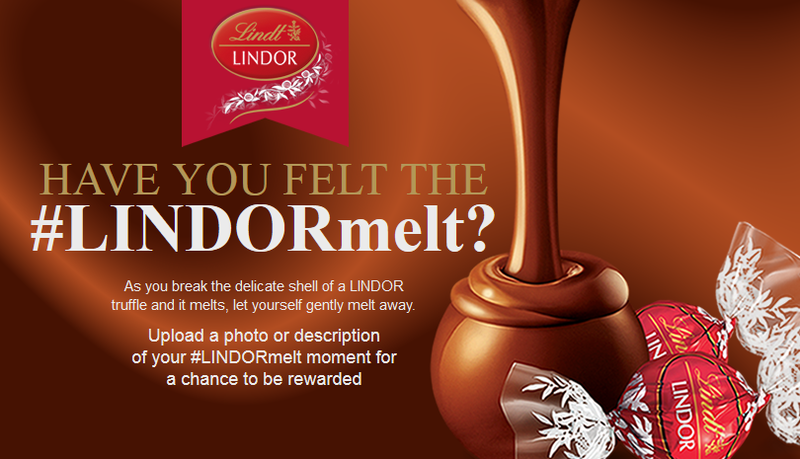 Leave a comment on this blog post telling me about a #LINDORmelt moment you would like to have with a LINDOR truffle! I would like to have a quiet moment reading a book and enjoying Lindor's white chocolate. I would have a Lindor melt moment after my kids are asleep. I would eat some delicious white chocolate truffles while reading or watching TV to unwind. Perfect with a good book and Lindor Truffles. I would like a #LINDORmelt moment after a stressful day and before a good bath. I'd love to have a #LINDORmelt moment in a jacuzzi at a hotel in Italy. I'd have a #LINDORmelt moment with my sister. I would love to have a #LindorMelt moment after a long day at work, to recharge my mood & begin my second job with my own four children! Love sharing them with my daughter and my husband! I would like to have a #LINDORmelt moment with my afternoon coffee. My moment would be when I visit my family at xmas and we drive around looking at lights. I need a #LINDORmelt moment curled up on the couch with a good movie. I would love to have my #LINDORmelt moment during my afternoon break at work. I would love to have a LindorMelt moment before bed, to help me relax before sleeping! My #LINDORmelt moment would be to have a LINDOR truffle while relaxing on my couch and watching a good movie. My LINDOR break is in the middle of the afternoon when I am high stressed from dealing with 140+ inmates.I just shut my eyes and enjoy the chocolate and am in my own world. I love have Lindor chocolate while sitting out by the bay, reading a book. The moment when I have my date night with hubby. i would like to have a lindor moment where i let one melt in my coffee and intensify the taste! My Lindor truffle moment would involve me relaxing in a hot bath w/some wine and listening to music. id eat one with my evening tea. I have a Lindt LINDOR truffle moment all day. I love chocolate and that is one of the better chocolates. I would love to have my Lindt Lindor Truffle moment when I settle on the sofa with a good book. I like to have a Lindor Melt Moment after I get home from work and before busy evening activities begin. I love to bake with them - either inside cupcakes or on top of the icing. I would love to have a Lindor melt moment when I am having me time reading a good book and relaxing. I love LINDOR milk chocolate truffles and sticks. My little heaven. 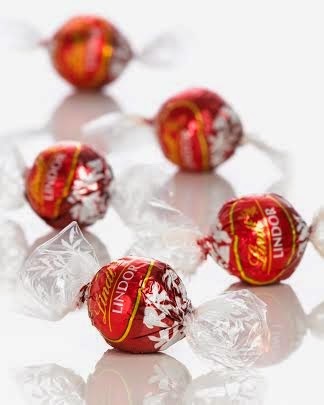 I'd like to have a Lindor melt moment while relaxing in front of my computer with a nice hot cup of coffee. A hot bubble bath and a glass or two of wine.